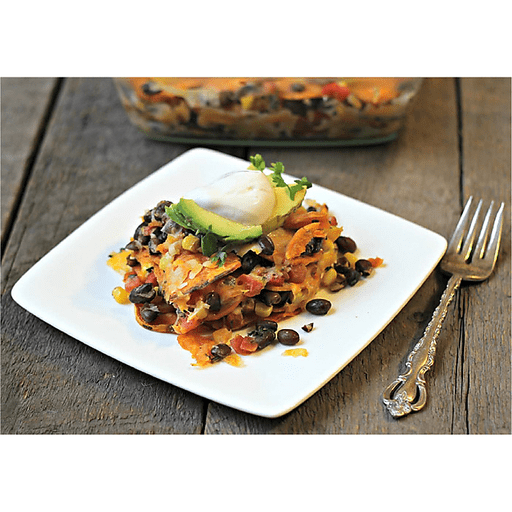 These Sweet Potato Nachos are sweet, so you feel like you're getting a treat, when in all actuality, they are a super-nutritious veggie! It’s football season, which also happens to be sweet potato season, so we decided to make these gems the base of a favorite football food, nachos! 1. Preheat oven to 400°F. Place the sweet potato rounds on a large baking sheet. Toss in olive oil and season with salt and pepper. Bake for 20 minutes or until crisp. At 10 minutes, flip each potato round with a spatula. 1. In a greased baking dish, assemble nachos. Layer ⅓ of the sweet potatoes on the bottom, followed by a layer of black beans, corn and cheese. Repeat layers, finishing with cheese on top. Bake for an additional 5-7 minutes, until cheese is melted. 1. Remove pan from oven, divide in to 6 dishes and top with cilantro, avocado and Greek yogurt. Serve immediately. Calories 310, Total Fat 18g (Saturated 7g, Trans 0g), Cholesterol 25mg, Sodium 400mg, Total Carbohydrate 28g (Dietary Fiber 7g, Sugars 8g), Protein 11g, Vitamin A 360%, Vitamin C 50%, Calcium 25%, Iron 6% *Nutritional values are an approximation. Actual nutritional values may vary due to preparation techniques, variations related to suppliers, regional and seasonal differences, or rounding.